14ymedio, Yoani Sanchez, Generation Y, Havana, 31 December 2018 — Miguel Díaz-Canel is receiving a hazing on Twitter. He arrived so late to this social network, in use for more than a decade by Cuban activists, that he is tripping over the primeval stones we ourselves discovered along the way. The first lesson is that everything one says on the network of the little blue bird does not remain only there, but multiplies and grows throughout the virtual community. This Sunday, the Cuban president commented that he watched the movie Inocencia, based on the history of medical students shot by the colonial regime, and he added to his message the phrase, “just as heroes abound, there is no shortage of bastards* in Cuba.” In addition to the grammatical nonsense of the phrase, the “hand-picked” president put his verbs in the present tense, suggesting that there are still people, here and how, who should not have been born on the island. Revolutionary bravado prevents him from erasing his tweet. Bad for him because the blunders are accumulating, and there are already several messages which transmit an idea of hatred, polarization and intolerance. Instead of endeavoring to make it known that he governs for all Cubans, the new tenant of the Plaza of the Revolution seems determined to please his predecessors. This tweet is not directed so much as an insult to us, the critics of the system, as to ingratiate himself with the historic generation of Castroism. In fewer than 280 characters, the Cuban president has put in writing his formula of governance. He is not going to represent all of us, he tends neither to conciliation nor harmony, rather he intends to confront us, polarize us and add more labels to the wide repertoire of insults this system has generated. Now, we are no longer only “worms,” “mercenaries” and “enemies,” but the attack has reached into the past, to the time of our birth, to that instant in which we drew breath for the first time. 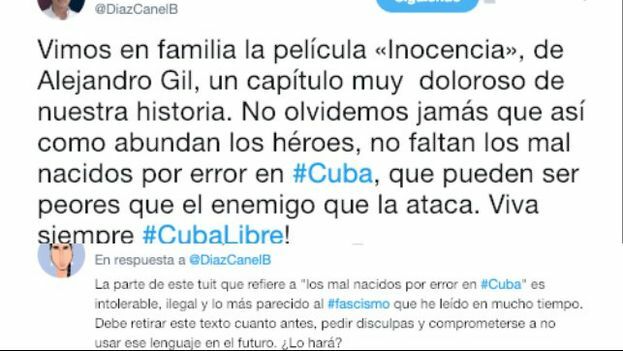 Poor Díaz-Canel, he does not know that the tweets remain and he just delivered a phrase that defines him in his just measure as extremist, fascist and dogmatic. If he had the least capacity for self-criticism, he would erase that message right now… but I suspect he will not do so. Translator’s note: The original wording is “los mal nacidos por error,” which in a literal English translation would read: “the badly born by mistake.” In Spanish, however, it is very strong expletive, and so has raised a correspondingly strong response across social networks.